Tactile sensing is one of the key technologies to realize an intelligent robotic system. For tactile sensing, generally, a resistive sensing device based on strain gauges and conductive polymers has been used. In these typical devices, the spatial resolution provided by them is low even if multiple sensor elements are arranged together, it may be difficult to measure detailed distribution about the contact and detect small objects. In order to realize a high spatial resolution, there have been many studies on tactile sensors employing camera. In this talk, I would like to review this kind of optical tactile sensors and methods how tactile information is converted to optical one to be captured by camera. Then I introduce a combined tactile and proximity sensing device using multiple small cameras for measuring both tactile and proximity information at a high spatial resolution and its application to robotic grasp control. He received the M.S. degree in computer science from Kyushu Institute of Technology in 2001, and Ph.D. degree in electronic engineering from Osaka University in 2004. Following his study as a Postdoctoral Fellow of Center for Advanced Science and Innovation, Osaka University, he joined Center for Advanced Medical Engineering and Informatics, Osaka University, as an Assistant Professor in 2005. 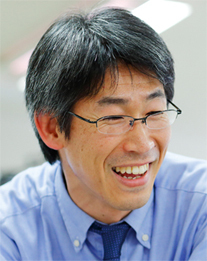 He is now an Associate Professor with Department of Robotics, Ritsumeikan University. His research interests include His current research interests include development of vision sensors and systems for intelligent robotic system.